Looking for Lighting Panelboards? Get a quote fast. Lighting panelboards: small but powerful. There are two broad categories of panelboards: lighting and appliance panelboards, and power distribution panelboards. Lighting panelboards are essentially smaller power distribution panelboards. Still used throughout commercial and industrial lighting systems, lighting panelboards utilize bolt-on breakers and are usually rated between 200A and 800A. They are highly configurable to meet your application’s specific needs and requirements. Whether you’re looking for a main breaker or a main lug panelboard, lighting panelboards are field convertible so they can be changed from main breaker to main lug and vice versa. Available in a variety of sizes and configurations, lighting panelboards allow for multi-pole circuit arrangements and are fit to control all types of lighting systems from warehouses to commercial businesses and more. How do you differentiate a lighting panelboard from a power distribution panelboard? 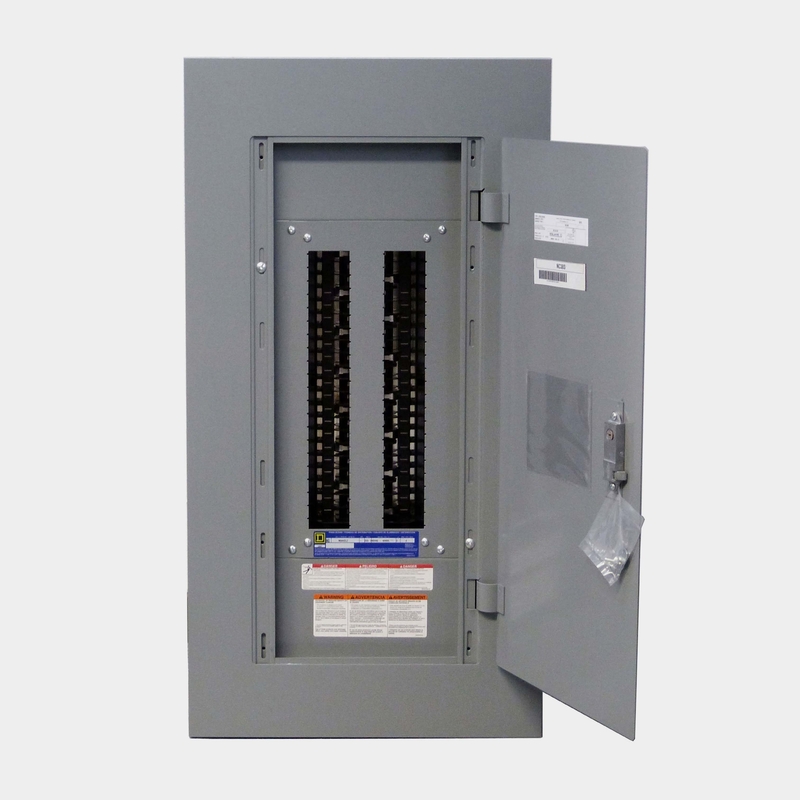 In order to qualify as a lighting panelboard, it must have at least 10% or more of the breakers and fuses protecting lighting and appliance branch circuits. In other words, at least 10% or more of the circuit protection devices in the panelboard are rated at 30A or less. Lighting panelboards only allow for 42 circuits, and once that limit is exceeded, you’ll need two (or more) panelboards. It’s important to note the distinction between circuits and devices, meaning that a single 2-pole circuit breaker, though one device, counts as 2 circuits. An important detail to note, however, is that this strict definition has since been removed from the NEC in 2008, and while there is no longer a textbook distinction between lighting and power distribution panels, these features and differences are still used colloquially to help categorize panelboards. Bay Power knows lighting panelboards. One of our missions at Bay Power is to make your panelboard purchase as easy as possible. That’s why we are proud to carry a wide variety of lighting panelboards in many standard panelboard sizes that meet any and all specifications. Take your pick from industry-leading lighting panelboard manufacturers and choose from Eaton panelboards, Square D panelboards, Siemens panelboards, and more. Have any old or unused Lighting Panelboards lying around? Don’t get rid of them just yet. While we stock a wide range of quality electrical products and solutions, both new and reconditioned, we also buy back your unwanted equipment. So, before deciding what to do with your old Lighting Panelboards and components, have one of our expert technicians take a look to see if we can save a few parts, save the environment, and save you some cash. Great service shouldn’t end after the purchase. We pride ourselves on the relationships we build with our customer-first mentality and the quality of our Lighting Panelboards and components. That’s why we offer a 1-year replacement warranty on all of our electrical products and solutions from the top manufacturers. Because when you buy with Bay Power, you buy with confidence. We are proud to stock a variety of competitively priced, new and reconditioned components from the leading manufacturers of Lighting Panelboards. Thanks to our extensive inventory of Lighting Panelboards and components, our resourceful and expertly trained staff will always be able to get the products that you need. Through our extensive network of suppliers, we are able to carry and acquire a huge variety of electrical products and solutions, so chances are if you need it, we can get it. Bay Power’s priority is providing you with reliable, high quality electrical hardware. That’s why our mission is to make sure our reconditioned electrical products and solutions function as perfectly as the day they were built. Because while the quality is high, the cost of Lighting Panelboards shouldn’t be. Our selection of new surplus Lighting Panelboards may not arrive brand new in a box, but they function just as well, and have never had electricity run through them. All of the quality, none of the packaging, always with our 1-year replacement warranty.